These snapshots from our annual report take you on a journey, transporting you to the countries that SPRING serves and introducing you to the people whose lives SPRING touched in 2016. The report highlights accomplishments through personal stories. 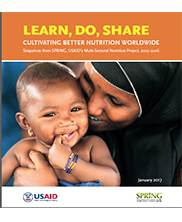 The SPRING project focuses on improving lives—especially in the first 1,000 days—by engaging across food, health, and hygiene sectors, by linking agriculture and nutrition, by aiming for social and behavior change through communication, by building the evidence base for what works, and by always, always, thinking big picture—which we call using a systems approach. JSI Research & Training Institute, Inc./SPRING Project. 2017.